This algorithm is used to evaluate time series / sequential forecasting algorithms for performance, accuracy and precision. This algorithm can also be used as an important component in an unsupervised anomaly detection process! This algorithm takes evaluation data in csv form; the algorithm expects each variable to be delimited using a comma and each timestep to be on a separate line. For more information, take a look at our univariate and bivariate examples. As each algorithm is different, this section will define any caveats or interesting attributes for our supported algorithms. This algorithm uses a univariate polynomial approximation function to replicate any trend and periodicity in the training data to assist in forecasting. What kind of data does this algorithm expect? This algorithm expects univariate (1 variable) dataset. An example of this would be the univariate example. Does this algorithm use model files? No, it's not a machine learning based algorithm which means there are no RNN model files. Ensure that your eval_percentage variable reflects how much data you wish to use to create your polynomial approximation function. If I want to know more about this algorithm, where should I look? For more information on this algorithm, check out it's algorithm page here: TimeSeries/Forecast. Any special caveats of this algorithm? This algorithm is well suited for business based use cases with regular seasonality, trends etc. It does struggle with other types of sequential datasets. This algorithm uses an LSTM neural network architecture that is capable of forecasting nonlinear and complex trends. When using custom data, you must build a model first. Read the algorithm documentation for more info. Yes it does, this algorithm utilizes built in memory to remember and preserve data that it has already seen! This algorithm was designed to be robust and flexible in it's data inputs; it can take any sort of CSV file with continuous variables. However as it does use a checkpoint model, your evaluation data should proceed directly after the data used to train / update your checkpoint model. 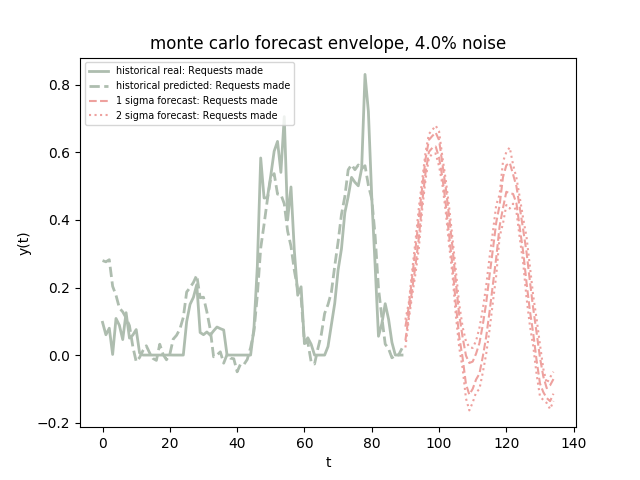 Yes, the algorithm makes really great graphs of it's forecasts! After performing an evaluation in advanced mode, write down the UUID associated with any interesting forecast and check your TimeSeries/GenerativeForecasting temp collection to access your graph images. We calculate error by first normalizing the evaluation data. This is done to enable comparisons across datasets with potentially wildly diverging ranges. Once our data is normalized we then calculate the Mean Absolute Error (MAE) for each forecast. Which all together with our normalized data would be called the Normal Mean Absolute Error. In most cases the resulting error value will be less than 1, however in some cases the error term might be greater. Looks like a bunch of valuable information; if you compare above with the generativeForecast algorithm output schema, there is something extra here. The index variable defines the location in our evaulation data array that our forecast operation uses as a break point, we pass all data to the algorithm up to this point, and tell it to predict the next N steps. This means that if you want to replicate any particular forecast, you just need the index and the algorithm. Need more info? below are our API docs! This algorithm returns two different types of output, depending on mode - simple and advanced.